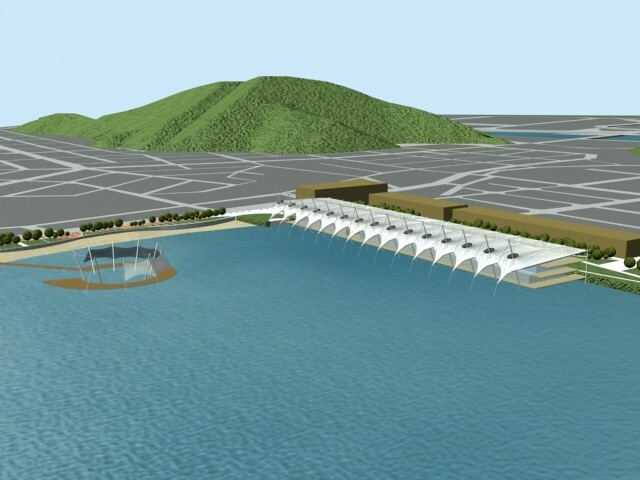 The continuous changes of image, of use, and even of the sense of property in the adjacent urban area to Gwangalli coastline, have caused a lack of identification, of development, and a decreasing presence of people looking for amusement in the place. An urban disorder had been generated that tends to tear apart the very well known Gwangalli’s beach from the city. 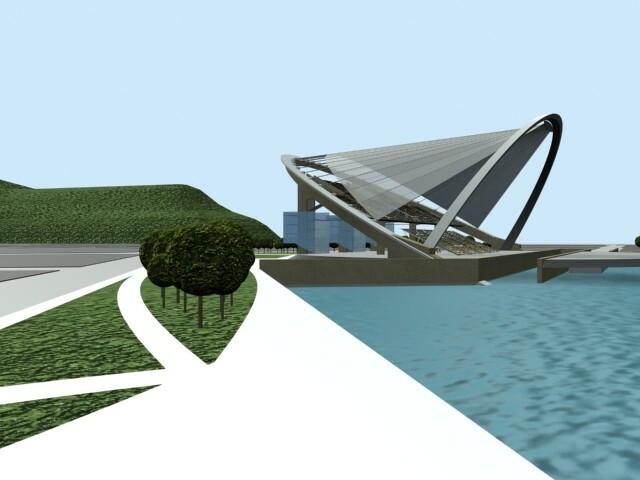 Additional to that urban situation, we realize that the Great Bridge of Gwangalli construction was driven by the need to solve functional problems, paying very little attention to other people requirements such as the natural pleasure to go to the beach. The Great Bridge interrupted the sense of the infinite and the range of vision of sea is lost. The great masses of the city have been progressively deteriorating the close relationship that should exist between citizens, pedestrians and inclusive the drivers, with the natural landscape of Busan. We understand that the role of Gwangalli district as a zone for tourism and amusement has not reached the expected levels when compared to neighbor areas. 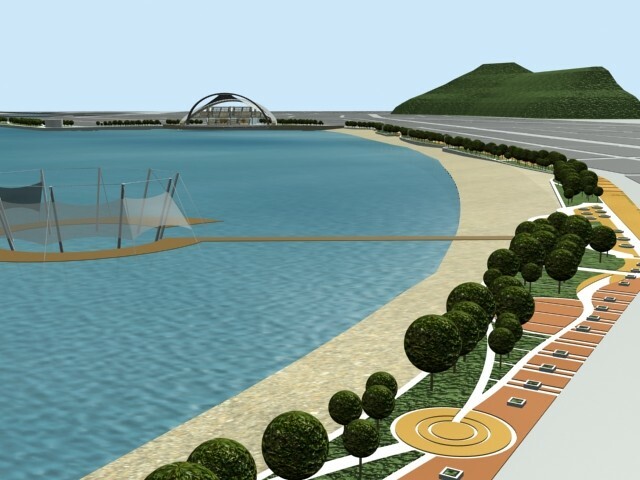 The perception of Gwangalli as a beach or coastline is poor as can be seen in the current images. The relation between the city and the sea has been limited to a mere physical fact, nonintegral, and without the sentimental and qualitative fact of recognition as an important urban space that conforms the limit between the constructed city and the untouched enviroment. 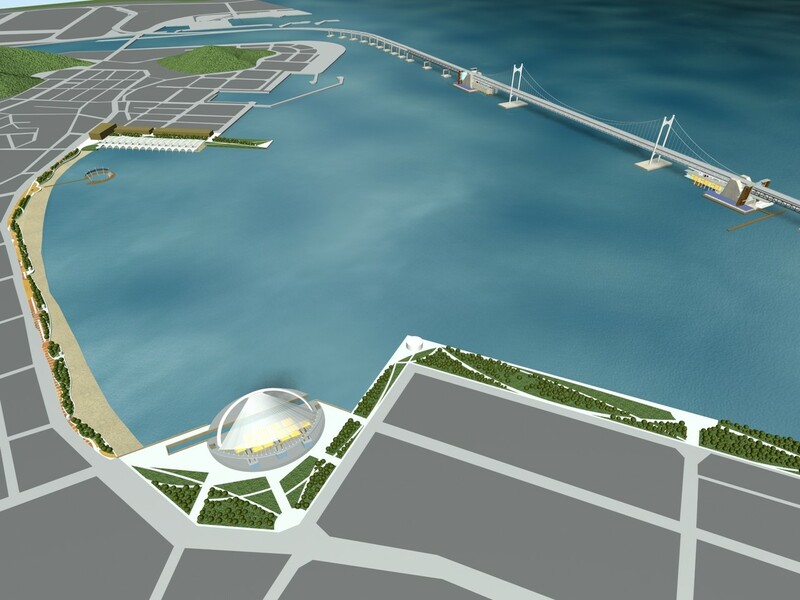 It is clear that the development and the growth of the masses, the buildings, and the great bridge of Gwangalli, are part of the current city image. As a consequence, the city is no longer the same and neither the beach. 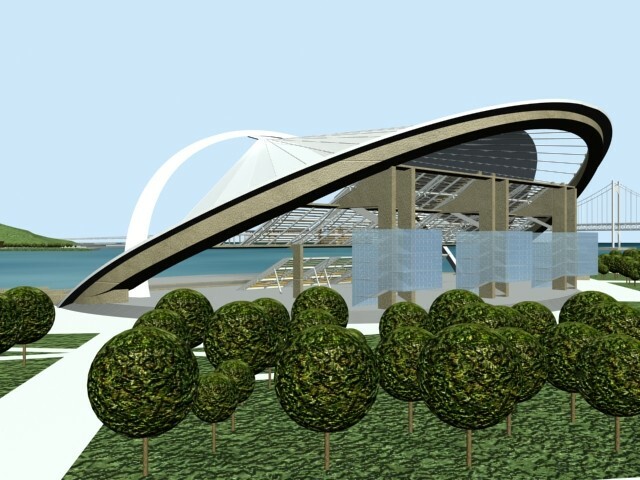 So, the Gwangalli’s beach will never be the same and it would be an useless effort trying to get back to what it was. The objective should be pointed to find solutions that could redefine urban spaces, landmarks, routes and footpaths to estimulate citizens, tourists and visitors to visit and make use of those spaces. This proposal, basically oriented to the understanding of the urban space, combined to the development of specific spaces and building construction with unique character, can be understood in a diaphanous way if we understand subjects and aspects like the image, the perception and the legibility of the city as well as the enviroment and the identity; concepts already been treated in the 60´s by Kevin Linch in his well-known book “The Image of the City”. Busan, as a port city, perhaps had a too rapid growth because of its commerce activities. Specifically, current Gwangalli area has a repetitive pattern in residential buildings suggesting that its urban structure priority was to satisfy industrial or commercial requirements. In situations like this, there is a tendency to use but not read the public spaces. The repetitiveness and few identifiable details stimulate this particular social behavior. The city in its growth, disordered and irreverent at certain point, caused the lost of identity, legibility and forgot that there should be a sincere relation in the enviroment, in other words, a total integration between land and sea (shoreline). This relationship must be reintegrated in a certainly subtle and integral way, with more daring details of intervention that would bring a certain shade of authenticity and variety. An audacity that could allow the easy recognition of attracting poles for the citizen, the tourist and the pedestrian. It is simply a matter of recreating the image of the place and therefore a part of the city. The recognition of a coherent structure that offers clear routes, granted masses that conform with the fillings, not only inert and unnoticed buildings, but empty spaces designed for the benefit of the citizen, who is after all the city owner. To improve the “image” of the enviroment to be modified, we have to keep in mind that inhabitants must be pleased, individually or in groups, at any moment they interrelates with the city. This effect, so simple and elementary, as the one when appreciating a singular architectonic work, is transferred to the city. It is clear that the city can also be understood as a construction in the space, but is a construction in a vast scale, of a thing that can only be perceived in the course of long lapses and routes. It is evident that any citizen could have long and clear bonds with one or another part of his city, and this image is embedded with memories and meanings. In this proposal we are triying to create an ambient filled with elements that can evoke the memories and create the own identity of the place. We suggest the creation of footpaths or habitual routes that not only sets out the transfer from a pole to another within the enviroment of the Gwangalli beach, but a suggestive amount of images within the route, that allows an easy recognition of the place. The inclusion of suggestive elements, loaded with a highly visual content is suggested, so that they can be easily recalled. Later, these routes and their respective poles or magnets of attraction will be described. The visual quality, mentioned in the previous paragraph, which must as well be specific, can be named as “urban landscape legibility“. This expression directly reffers as to how easy and in a coherent way, the parts of the urban and architectonic set can be recognized and be organized, taking in account certain guidelines. In this proposal it is shown that the routes, which are called “space transitions”, are intended to be organized from the urban point of view, offering specific visual quality and habitual routes of easy recognition and varied use. In the same way that this text is legible, and therefore it can visually be apprehended through a connected guideline of reconocibles symbols, a city or an extract of it, (in the case of Gwangalli beach), can be clearly legible if their districts, outstanding sites or elements, habitual routes, among others, are easily identifiable and they are grouped, also, in a global guideline. In this issue, the individual elements, like the poles, classifieds in commercial, cultural, entertainment/sport and touristic; and the habitual routes between these poles, understood as footpaths, are those that grouped in a global, but nonabsolute way, (accepting certain individuality that heightens the quality of the spaces) permits a more clear “legibility” of the space. Thus, its recognition will be more precise by the citizen and can become a conglomerate of spaces with its own identity, which must be understood like a whole and not like an atom that splits. In this case we notice that the issued routes can be understood as ”tracks”, that poles developed in the intervention sites can behave like “landmarks”, and that the transition spaces between the poles can be interpreted as ”nodes”. The conjunction of these elements and their understanding like a whole, allows it to have its own image within the city, and therefore, the whole set can be recognized like a district or subsector. 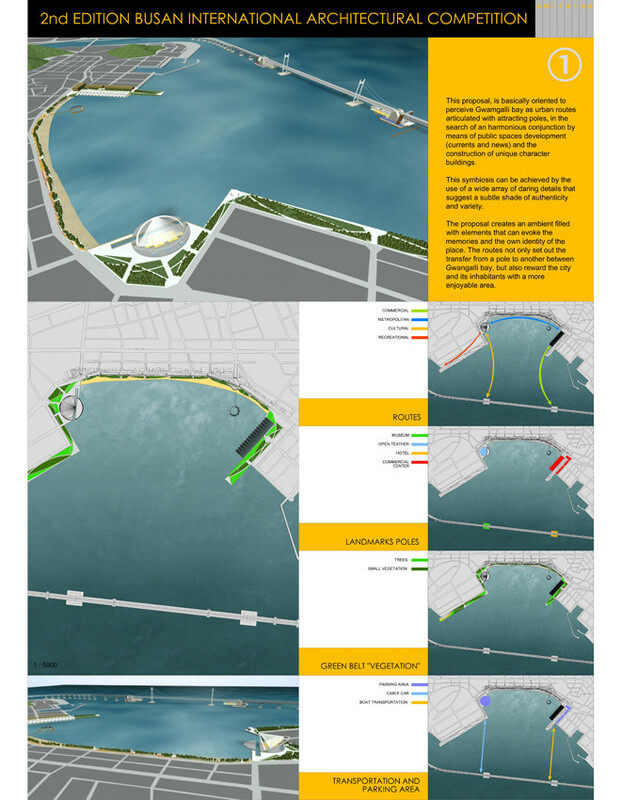 In our proposal we raised the integration of the city, the Great Bridge and the sea through four (4) space transitions that are explained below in progressive order. These transitions are generated from four (4) poles or urban magnets along different meeting points between the city and the sea. These poles of development have been selected, based on the places, areas or zones referred by the authorities and organizers of this contest. 1. The Commercial Pole: Represented by the intervention of the space, adjacent to the beach of Gwangalli in the North area, where the development of constructions for commercial purpose is considered. 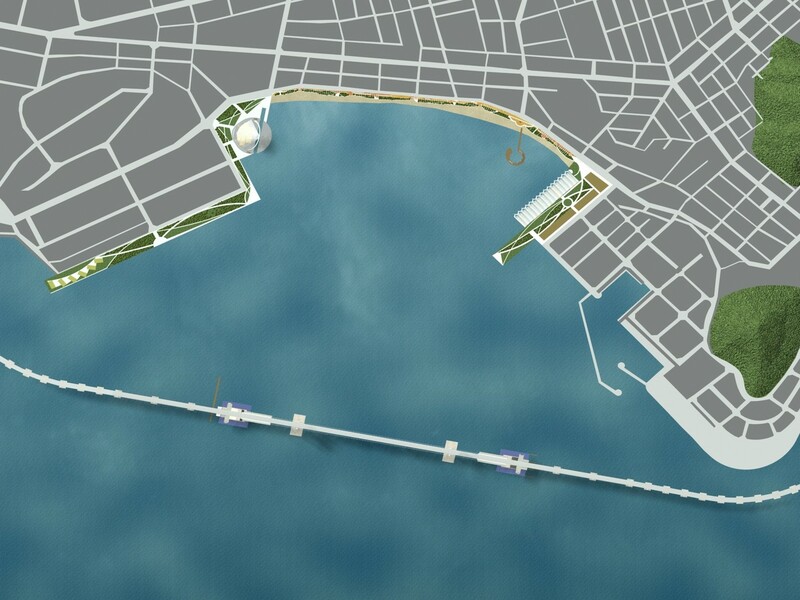 It is intended to create a development pole as the articulation of two routes: one along the beach where the visual line will always be above the sea level, the second one that ends in a pier for boats to visit the Touristic Pole. A plaza solves the transition between the route along the beach boulevard and its intersecting point with the commercial buildings. One of these buildings is the vanishing point of the urban net as long as it gets closer to the water. The presence of the vegetation through the poles allows to the identification and recognition of the continuity of the space. 2. The Touristic Pole: It is located at the northern base of Gwangalli Bridge. It represents the culmination of one of the designed routes. This pole is a hotel building from where it is possible to look to both sides: towards the city and towards the wide open sea. 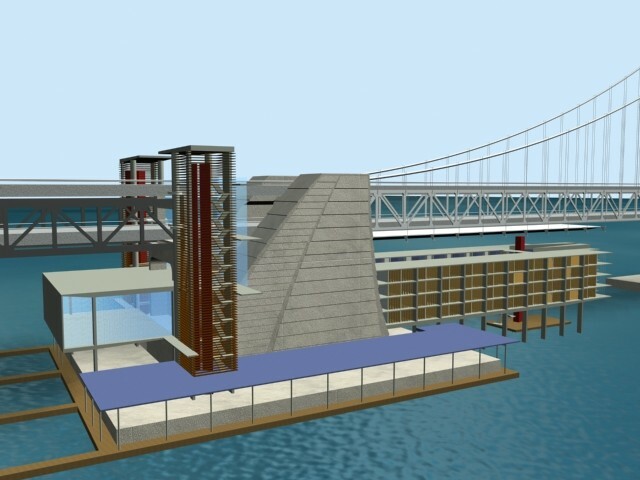 The access to this hotel could be made in two different ways: by boat, coming from the commercial pole, or by the bridge through a panoramic elevator built between bridge traffic level and hotel lobby area. 3. The Cultural Pole: This pole is a building located at the southern base of the Great Bridge. This pole, in conjunction with the previous one, suggest a lower level open bridge complementing the architectural language of the fundamental construction. It is reachable by the sea, by a cablecar coming from the Recreational Pole, or by the same bridge (a similar concept as in the previous pole). 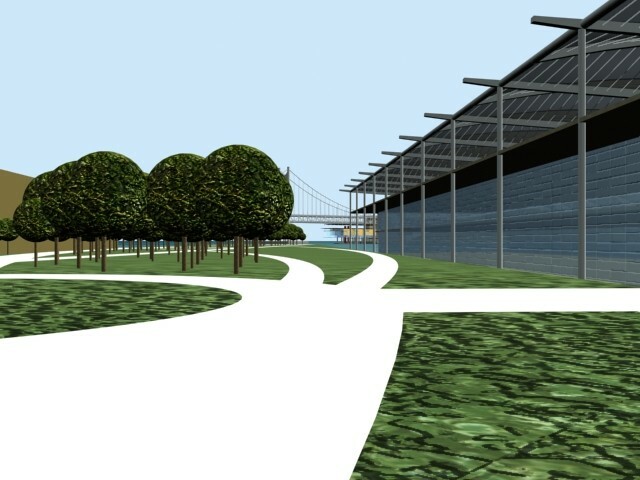 With the goal of conforming a space for the massive meeting, we propose the creation of a museum and exhibition hall. 4. The Recreational Pole: Represented by an open theater in the south end of the beach, adjacent to the “Beach Apartments” and acts as an extension of the coastline. It the intersecting point of three routes: the commercial one, the cultural one and the recreational one. 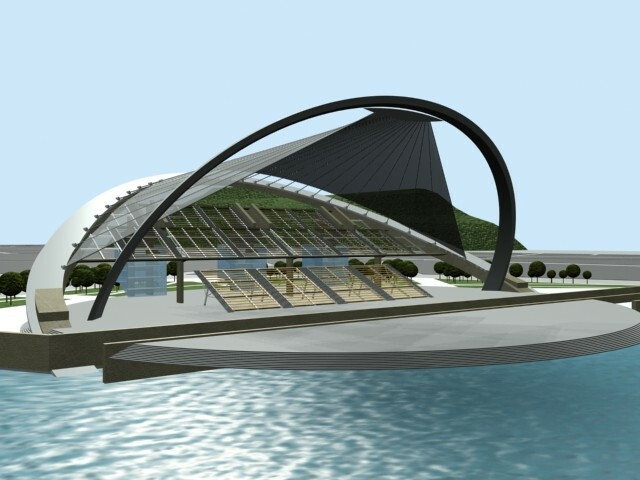 The installation is intended to be used as headquarter for festivals and shows, that are periodically performed in Busan (Beach festival, Film festival, etc.). Also could be used for other recreational or sport activities. 1. The Commercial Route: Connects the Commercial Buildings and the Hotel. 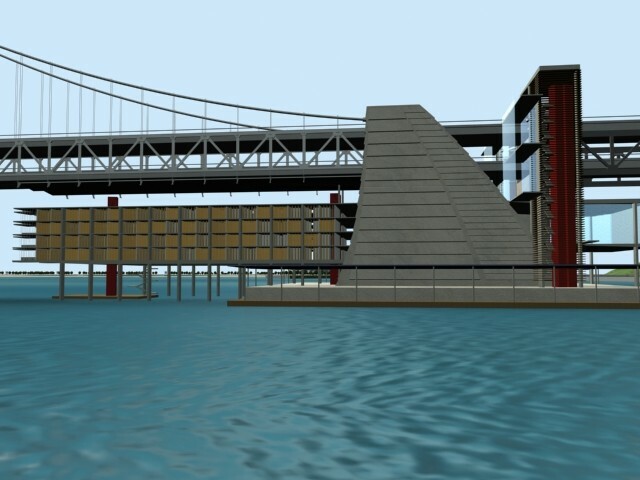 It has a transition process, going across a green area between the Commercial Buildings towards a pier, and from there becomes in a navigation route. 2. The Touristic Route: Represented by the linear connection that goes along the beach, between the Commercial and Recreational poles. It is intended to create a representative public and city like space, concentrating the transition between the constructed space of buildings, the street and the sea. 3. The Cultural Route: Starts at the Recreational Pole, going through a green park with sculptures and other artistic manifestations, arrives to the cablecar terminal, and continues by this way to the Museum located at the Cultural Pole. 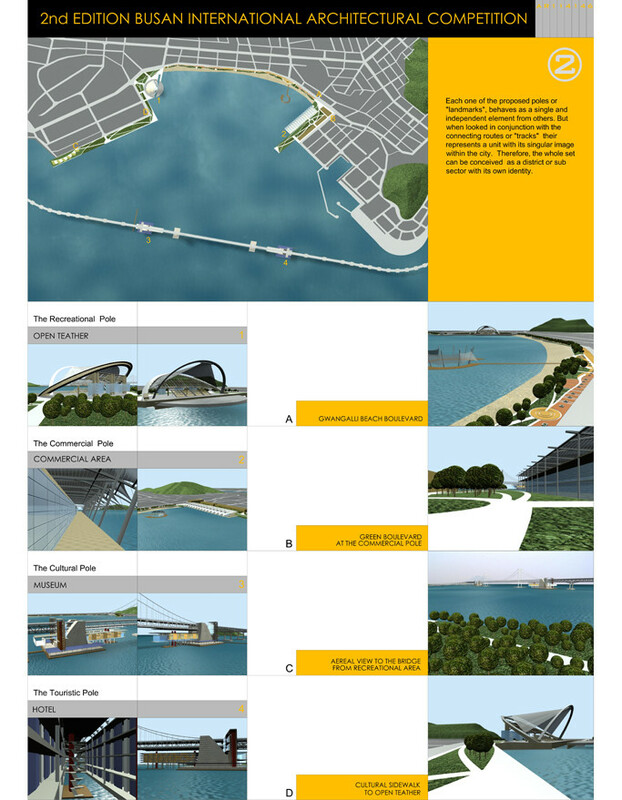 It has a similar concept like the Commercial Route, that is the integration of land and water. 4. The Recrational Route: This route starts at the Recreational Pole and extend the green belt towards the south section of the Beach Aparments area, offering a new perspective of the seashore by means of recreation and sport activities in this congested zone.